Kanye West threw his microphone in the air and walked off stage during his latest performance. The rapper was bringing down the curtain at the closing ceremony of the Pan American Games in Toronto, Canada, when there was a “technical issue” which caused his mic to cut out. Footage posted online shows Kanye throwing the mic into the air before walking off the stage as a crowd of thousands look on. The Twitter account of the CBC Olympics, official broadcaster of the Games, said Kanye’s mic “cut out in-stadium due to technical issue”. 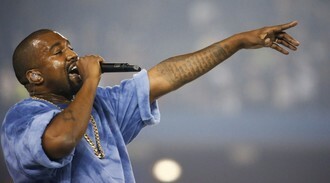 Prior to the ceremony a petition had been launched online campaigning for organisers to cancel Kanye’s performance, and had gained almost 136,000 signatures. Some Canadian residents were unhappy that the Georgia-born rapper was chosen to close the sporting event, which takes place every four years, as they would prefer to have seen some home-grown talent, such a Drake, perform. Disclosure have premiered their collaboration with Sam Smith. Taylor Swift’s friend, Gigi Hadid, has revealed she is to star in Calvin Harris’s new music video. Ellie Goulding appears to have dropped her biggest yet hint that she has recorded the theme song for the new James Bond film. Bobby Brown is "completely numb" following the death of his daughter. Avril Lavigne gives first performance since revealing Lyme disease battle. Swedish police briefly held US rapper Snoop Dogg on suspicion of drug use after he performed a concert near Stockholm. Bobbi Kristina Brown will be buried next to her mother, the late Whitney Houston. Niall Horan has warned One Direction fans to stop chasing their cars. Rita Ora defends Chris Brown duet: 'If you have a great song then no one cares'.